If Game of Thrones star Sophie Turner’s performance as Sansa Stark is any indication, she’s got this whole overcoming demons and coming out stronger on the other side thing down. And turns out, that’ll come in handy in X-Men: Dark Phoenix. Sophie Turner will transform from Jean Grey into the titular mutant in the new movie and thanks to a first look at the project, we’re getting the sense that the story that will rise out of the ashes here isn’t like X-Men stories we’ve seen on-screen before. Set about 10 years after the events of last year’s X-Men: Apocalypse, Dark Phoenix finds the X-Men — Beast (Nicholas Hoult), Mystique (Jennifer Lawrence), Storm (Alexandra Shipp), Quicksilver (Evan Peters), Nightcrawler (Kodi Smit-McPhee), and others — in the national spotlight, with Charles Xavier (James McAvoy) getting a big head from the fame. 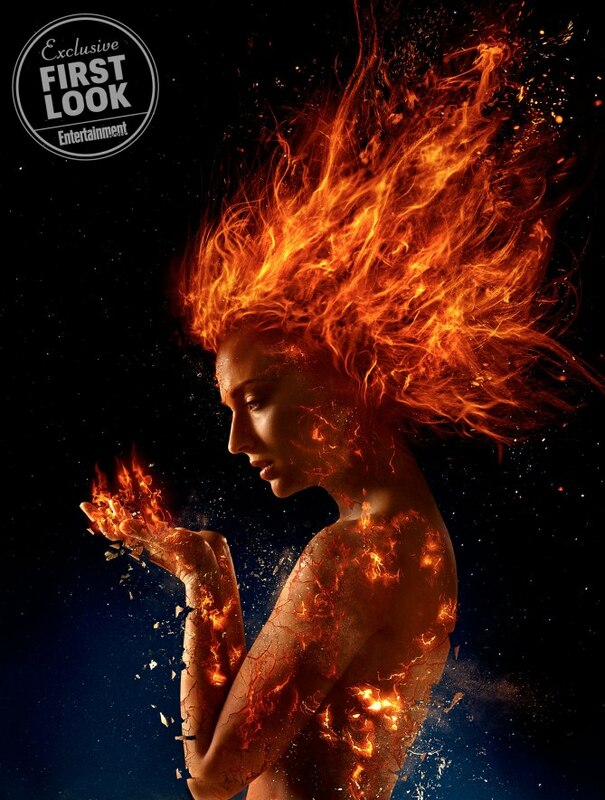 The group is sent to space on a mission (a first for an X-Men movie) where a solar flare sparks a dark new force within Jean Grey (Sophie Turner), bringing about the Phoenix. Take a look, via Entertainment Weekly, here! What seems so different about this movie in comparison to the X-Men tales before it (other than its focus on a female character, which we’re totally into) is the tone. Director Simon Kinberg apparently tried to tell Jean Grey’s story in his screenplay for X-Men: The Last Stand in 2006, but the studio sidelined that plan. Now, Kinberg’s take on the comic by Chris Claremont will put Jean’s mental struggle against her own thoughts front and center. Accordingly, Turner studied multiple personality disorders to get herself ready for the part. "So many scenes I have to go from broken-down Jean — that’s when she's most susceptible to Phoenix infiltrating her — to this confident, arrogant, judgmental character within milliseconds," Turner told EW. The star turn in Phoenix will only add to the killing-it streak Turner’s been having lately. Aside from her Game of Thrones character really coming into her own this past season, Turner will be starring in a survival biopic. (She also has her IRL marriage to Joe Jonas on the horizon, too.) There haven’t really been any professional ashes in Sophie Turner’s case, but still, we’re always rooting for this Phoenix to rise.